Love Mexican! This looks great! Yummm my absolute favorite! So glad you like them too! 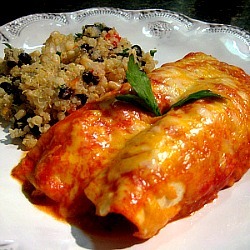 I posted enchiladas today too! This version sounds fabulous and I love Pink Parsley! My husband made this last night with leftover chicken from the night before. It was yummy! You need to check out http://www.tastebook.com Make yourself you own cookbook! I’ve done it and it’s so great to have and give as gifts! Great idea! I will check it out! I made these for dinner tonight. Fantastic! Thanks for sharing the recipe. on June 6, 2011 at 10:04 pm | Reply Peanut Butter Runner » Blog Archive » Monday positivity…and dress details! I doubled this recipe and made for a crew at the beach this past week and they were FABULOUS along with the Mexican Quinoa which was a huge hit as well (which was even better cold the next day!). You cannot go wrong with Cooks Illustrated – the only magazine I still receive in the mail. – Thanks for sharing – cannot wait to make them again! Just wanted to say that I made these last night and they were delicious! Thanks for the recipe!